How fast does it take for your family to fill up the garbage can after it is been emptied by the collectors? A weekly pickup seems to be just about right for every household but the closer it gets to pickup the day, the more likely it is for that can to start getting crammed with bags of trash. If a day gets skipped because of holidays or snow, then you really have to start packing down the trash. Of course, no matter how good you are at cramming things into a trash can, there are some big garbage items that you’ll never be able to get in there. For that kind of removal, you need to bring in Junk King Albany. Garbage is really anything that is leftover, broken or never going to be used again. How many things in your home would fit in that description? There could be all kinds of furniture that you would like to toss out. Usually those are chairs, sofas, recliners and tables that find their way down into the basement or out into the garage. Those are also the kinds of things that most often require two movers to get up and out of the house. That is exactly what Junk King is going to provide. Not only will these movers be licensed and insured, but they also won’t have problem climbing stairs or lifting a heavy object. What about those items that are one the “bulky” side of things like an entertainment center, book shelf or bed frame? The Junk King crews are great problem solvers when it come to taking things apart. Remember, this is what they do day in and day out. It is hard to imaging any big garbage hauling challenge you could present to them that they haven’t already done at least a dozen times over. When you’re ready to get that junk hauled away, then set up your appointment with Junk King. Just know that they like to move fast. 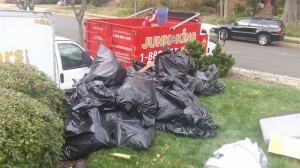 Are you ready to get all your big garbage hauled away today? One call to Junk King Albany can make it happen. This entry was posted in Albany Junk Removal and tagged big garbage, Junk King, junk removal on September 30, 2018 by Junk King. Last updated September 30, 2018 . The renovation clock is ticking. If you want to take care of a remodel project and have it completed before the upcoming holiday season, the now is the time to get started. With the right contractor, you can probably even complete a total kitchen remodel in Time for Thanksgiving dinner. Maybe you’re just taking on a smaller project like having new carpeting installed. That is easily handled within a day with the right installers. As for getting rid of that old carpet, that can be taken care of in a matter of minutes when you turn that job over to Junk King Albany. Every removal session set up by Junk King is staffed by two strong movers. That is exactly what you’ll need to get that rolled up old carpet out of your living room. If you’re replacing carpet from upstairs, then the team from Junk King will be able to carefully bring down that roll from there as well. They have a lot of experience with this type of removal so that know that is important to clear a path between where the carper roll sits and the front door. Once outside, it will be tossed onto the back of the Junk King truck but that’s no the only thing you can get tossed back there. As for the cost of this helpful service, you won’t have to pay by the pound. That is going to make a big difference with a rolled up section of wall to wall carpet. Instead, Junk King charges but the amount of space that your stuff fills on the back of the truck. It’s a very fair approach for this type of work. 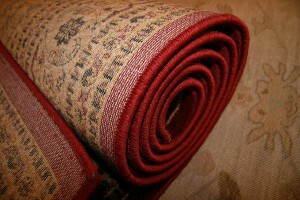 Don’t worry about getting rid of your old carpet and unwanted furniture. Just let Junk King Albany take care of it and the problem will be solved. This entry was posted in Albany Junk Removal and tagged Junk King, junk removal, old carpets on September 18, 2018 by Junk King. Last updated September 18, 2018 .